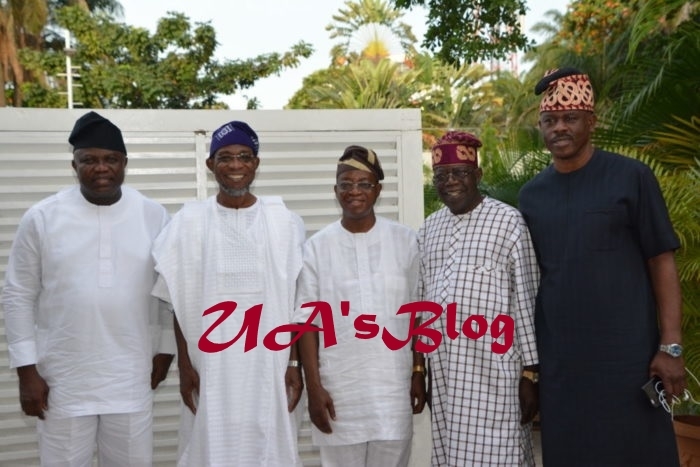 Osun state Governor-elect, Alhaji Gboyega Oyetola has paid a visit to Bola Ahmed Tinubu following his election victory. All Progressives Congress (APC) National Leader, Asiwaju Bola Tinubu says the party’s victory in the Osun governorship election shows that democracy is at work in the country. Tinubu said this after he received Gov. 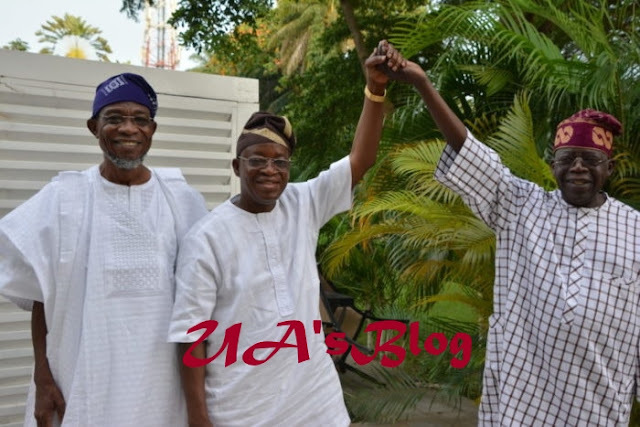 Rauf Aregbesola of Osun and the newly elected state Governor, Alhaji Gboyega Oyetola at his Resident in Ikoyi, Lagos on Friday. Tinubu also received Gov. Akinwunmi Ambode, who faces on Sunday a primary election against Babajide Sanwo-Olu, said to be Tinubu’s candidate and Obafemi Hamzat. Ambode came with Mr Musiliu Obanikoro, a former Minister of State for Defence. The News Agency of Nigeria (NAN) reports that Oyetola of the All Progressives Congress (APC) was declared as winner by the Independent National Electoral Commission (INEC) at the end of Thursday’s re-run election in seven polling units. He polled a total of 255,505 votes to defeat his closest rival and candidate of the Peoples Democratic Party (PDP), Sen. Ademola Adeleke, who polled 255,023 votes. Tinubu said that the people of Osun exercised their rights and chose the best candidate to drive development in the state. ”The people of Osun, the state of ‘Omoluabi’ demonstrated their strong determination, they have good judgment, they exercised their rights to choose the best candidate necessary for developmental programmes in the state. ”When you look at those who were running, you have the best, the most brilliant, the most qualified, competent, calm and great candidate. ”That is what they have done to show that democracy is at work. “Democracy is about the people, and the people have equally exercised their right to be tolerant, patient, persevere and do what is necessary to develop the economy of the state. ”And you need the most competent person that will perform. ”In leadership, you need a thinker and a doer that must be present in the mind, body and soul; that person who will carry the responsibility of he state and I feel that Mr Oyetola fits perfectly,” he said. ”The rest is for the people of Osun state to rally round and give him the necessary support and encourage him to do well following the legacy already built. ”He already has a blueprint for development agenda,” he said. On the APC presidential primary, the National leader said the huge support from party faithfuls in Lagos State was a signal that the party would emerge victorious in 2019. “Democracy is at work and we have managed the party till now. ”Here in Lagos, about 2.3 million people including myself, as I am standing before you supported and participated in voting for President Muhammadu Buhari. ”And I want to tell you that this has sent a tone or signal to what will come in February 2019, ” Tinubu said.